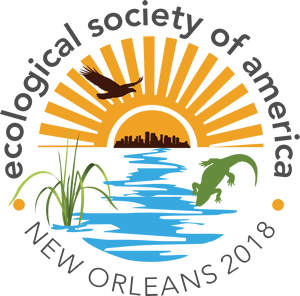 We invite submission of abstracts for contributed poster presentations for the 2018 ESA Annual Meeting. Abstracts are encouraged to address the meeting theme “Extreme events, ecosystem resilience and human well-being” if appropriate, but doing so is not necessary. We welcome submissions that report interdisciplinary work, address communication with broad audiences, or explore ways of teaching ecology at any level. Posters presentations are two hours long and give presenters an opportunity for extended discussion and networking. Individually submitted contributed abstracts will be grouped together to create poster sessions organized around a common theme. Abstract authors will rank their preferred session themes as part of the abstract submission process. Poster sessions are 4:30-6:30 pm Monday through Thursday. By submitting an abstract, a presenting author is indicating they will be available during any of the possible time slots. During abstract submission, you will rank 3 themes to guide the grouping of your presentation into a session with similar presentations. Consider the themes carefully. They were updated in early 2017. Poster sessions are Monday-Thursday, 4:30-6:30 PM. By submitting an abstract, you are indicating you will be available during any of the possible time slots. Lucy Braun, an eminent plant ecologist and one of the charter members of the Society, studied and mapped the deciduous forest regions of eastern North America and described them in her classic book The Deciduous Forests of Eastern North America. To honor her, the E. Lucy Braun Award is given to a student for the outstanding poster presentation at the ESA Annual Meeting. If you are a student (undergraduate or graduate) who is the presenting author of a presentation, you are eligible to be considered. Papers and posters will be judged on significance of ideas, creativity, quality of methodology, validity of conclusions drawn from results, and clarity of presentation. The students selected for these awards will be announced in the ESA Bulletin after the Annual Meeting. A certificate and a check for $500 will be presented to the recipient at the following ESA Annual Meeting. While all students are encouraged to apply, winning papers and posters typically describe fully completed projects. Conversation is encouraged at our poster sessions. These sessions provide an opportunity for extended discussion and networking. A cash bar will be available. Poster sessions are 4:30-6:30 PM Monday through Thursday, with a different set of posters scheduled every day. Presenters are required to be present for the duration of their scheduled 2-hour session. Each presenter should hang their poster before the session begins and remove it at the end of the session. The Exhibit Hall will be open starting at 11:30 am, Monday through Thursday. Poster presenters will also be allowed access from 7 AM to 8 AM each morning to hang their posters before morning sessions begin (make sure you are wearing your badge).